Among the struggles of achieving an independent life, individuals with disabilities often feel isolated socially. 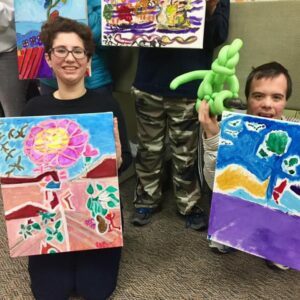 At Center for Independent Futures, we offer a wide variety of social clubs and activities for our participants to engage with their interests in a community setting. Our activities calendar is currently full of fun events in Evanston, but we are creating opportunities to be active in more communities. In the Evanston area, we host several different clubs for participants. For movie lovers, we have Saturday Cinema, where members vote on the monthly film and participate in discussions after each movie. Our participants who want active lifestyles can take part in yoga, walking club, and even a biking club in the warmer months. With so many options to choose from, anyone can find an activity that interests them. We are excited to announce Center for Independent Futures is planning to expand our activities calendar to the Highland Park area. We will be hosting a Meet and Greet at West Ridge Center for adults with disabilities and their families. Center for Independent Futures wants to hear from Highland Park residents about what kinds of activities you want to see come to the community. Center for Independent Futures staff will be present on Tuesday, March 20, from 4:00 – 6:30 to meet the Highland Park community. Feel free to drop in for lively discussions, snacks, and beverages. Creating relationships is an important part of Center for Independent Futures, and we are excited to start building in Highland Park. For more information, reach out to DeeDee Goldman dgoldman@independentfutures.com.